Please join us for a breakfast meeting discussion on Wednesday, April 24, on "Legal Reform as a Catalyst for Sustained Economic Growth in Russia." USRBC, in conjunction with The International Law Institute, is pleased to present this program featuring Denis Karimov, one of the leading experts and commentators on Russian administrative law, and William Pomeranz, Deputy Director of the Wilson Center's Kennan Institute. 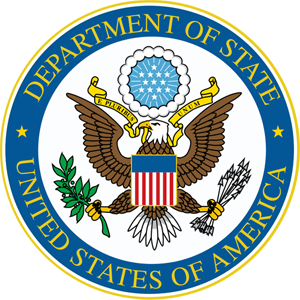 The next USRBC members-only monthly meeting with the U.S. Department of State's Russia Desk will take place on Thursday, May 2nd, 2019, from 11:00 AM to 12:30 PM. 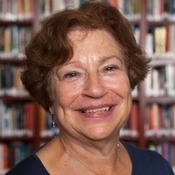 In these meetings we are regularly joined by the Director for the Russia Desk, Nicholas Berliner, or the Deputy Director, Ruta Elvikis, as well as the economic team led by Hayward Alto and including Mary Harrington. 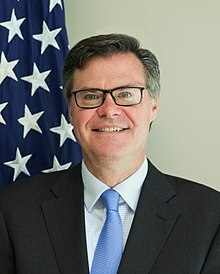 The meetings provide an excellent opportunity for members to receive an up-to-date briefing by the State Department's Russia specialists on the geopolitical bilateral agenda in an intimate setting, while ensuring that key government officials stay current on relevant bilateral commercial matters. 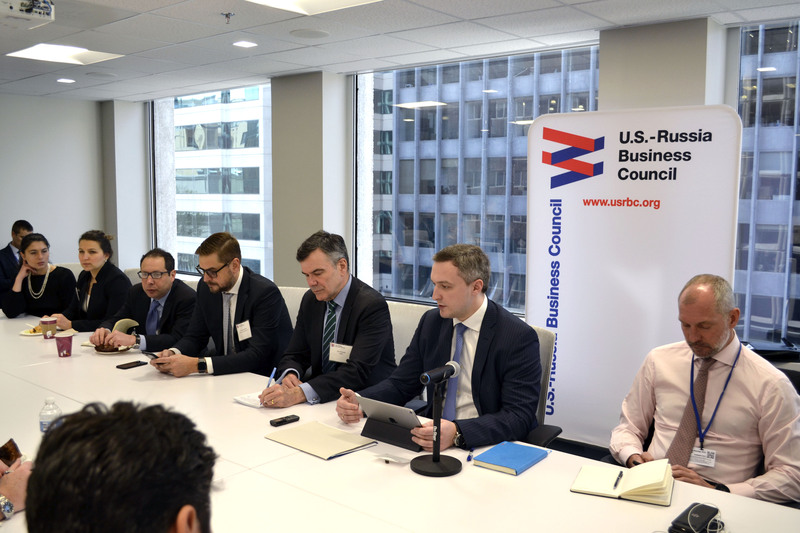 USRBC held a members-only roundtable at its Washington, DC Office with RF Deputy Minister of Economic Development Timur Maximov. Deputy Minister Maximov discussed the Russian government's economic reform agenda and macroeconomic policy priorities for the coming years, including areas of potential interest to foreign investors. He also highlighted his Ministry's role in implementing regulatory reforms to support Russia's National Development Projects, including the comprehensive inventory of state regulations affecting business and the government's plan for Transforming the Business Climate, which envisions profound legislative and regulatory changes to improve the conditions for business. USRBC hosted a discussion at its Washington, DC office with renowned Russia expert Angela Stent about U.S.-Russia relations and her new book, “Putin’s World: Russia Against the West and with the Rest.” In her new book, Ms. Stent explores Russia’s resurgence in global politics and its new role as a disrupter in diplomatic relations with China to the Middle East to the West. 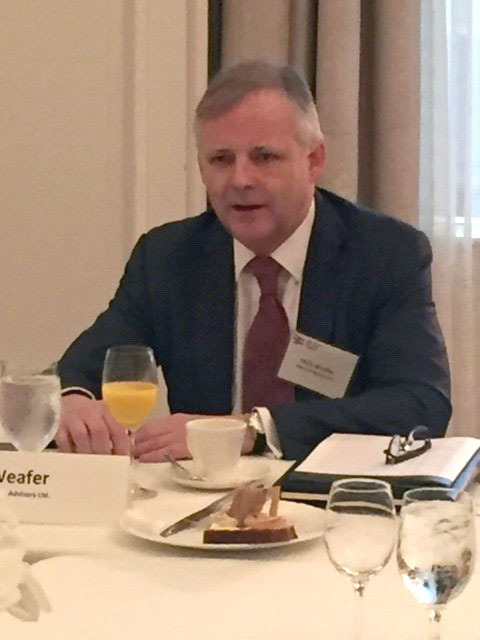 USRBC hosted an exclusive breakfast briefing and discussion in Houston with Chris Weafer, Founding Partner of Macro-Advisory Ltd, a USRBC member. The event focused on the economic and business outlook for the hydrocarbon economies in Eurasia, including Russia, Kazakhstan, Azerbaijan, Turkmenistan, and Uzbekistan. Participants explored investment opportunities and risks for international companies working in the oil and gas sector in Russia and across the region. Other issues discussed included implications of sanctions for foreign companies active in Russia’s “strategic” sectors, Russia’s cooperation with OPEC; China's growing role in the Eurasia region energy sector and implications for Western companies; consequences of Russia's “tax maneuver” and other possible changes in the tax regime; petrochemical and refinery investment trends; and potential opportunities for Westerns companies related to the development of Ukraine’s shale reserves. Please mark your calendars and save the date for the USRBC 2019 Annual Meeting on November 7th and 8th, 2019, in New York, NY. The Annual Meeting's business sessions will again be held at the Kimpton Hotel Eventi (851 6th Ave) and the Gala Dinner will take place at the Morgan Library (225 Madison Ave.) The Annual Meeting will start midday on Thursday, November 7th, with our Gala Dinner that evening, and the event will conclude midday Friday, November 8th. The U.S.-Russia Business Council, in partnership with the American Chamber of Commerce in Russia and the Eurasian Economic Commission (EEC), held a conference in Moscow on “Eurasian Economic Union: Integration Challenges.” The program featured EEC Chairman Tigran Sargsyan and EEC and Russian ministers discussing progress in and obstacles to Eurasian economic integration, including investment opportunities in key sectors of the EAEU economies; production localization; digitalization in the real sector; and harmonization of technical regulations and customs procedures within the EAEU. USRBC President and CEO Dan Russell moderated a panel discussion on technical regulation and best business practices in the EAEU markets. The USRBC 2018 Annual Meeting took place in New York on November 15-16, 2018. Similar to the 2017 Annual Meeting, the program started at noon on Thursday, November 15, with an Opening Keynote Luncheon and concluded mid-afternoon on Friday, November 16, after a Closing Luncheon. The Gala Dinner took place on November 15 at Prince George Ballroom. Further event details including pictures and speakers' presentations will be posted shortly. USRBC held a videoconference on "Assessing Russia's Economic Outlook" with Macro-Advisory Senior Partner Chris Weafer. 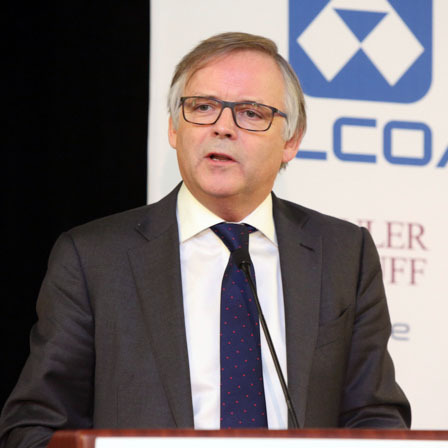 Mr. Weafer discussed the outlook for Russia’s economy over near- and medium-term under increasing sanctions threat as well as the political outlook as the Russian government debates a number of difficult economic policy moves. 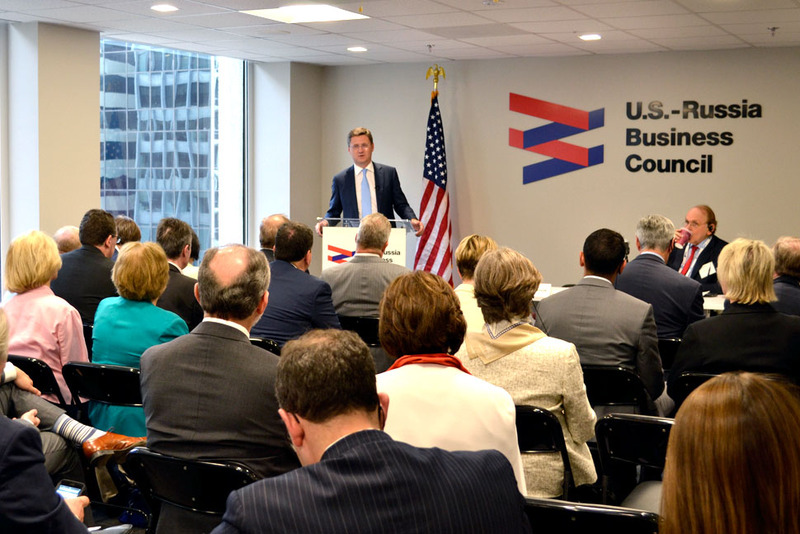 USRBC hosted a roundtable for Council members with Deputy U.S. Trade Representative and Chief of Mission in Geneva Ambassador Dennis Shea at USTR office in Washington, DC. 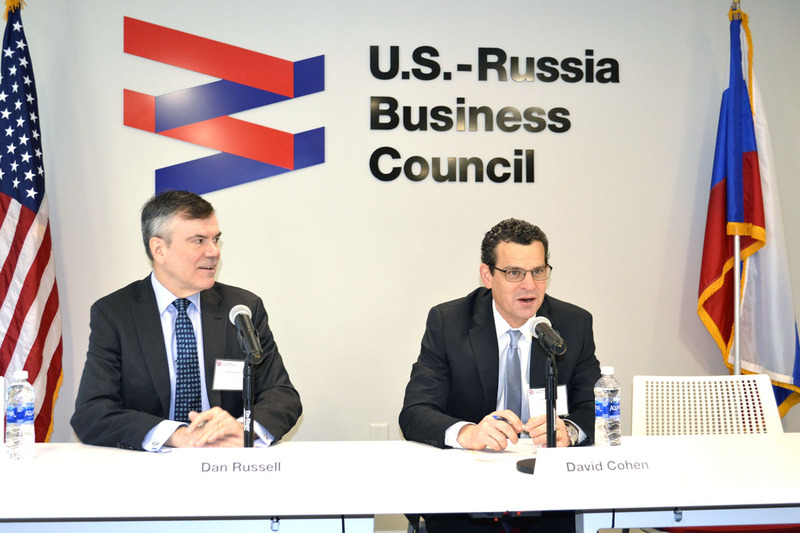 USRBC members had the opportunity to hear from a leading Trump Administration trade official on developments at the World Trade Organization (WTO), who respond to their questions regarding engagement there with the Russian Federation. This meeting was especially timely as Russia is working to submit to the WTO its list of U.S. goods that would be subject to retaliatory tariffs in response to U.S. section 232 aluminum and steel tariffs. USRBC hosted a discussion for Council members with Minister of Energy Alexander Novak on Tuesday, June 26 in its Washington, DC office. Minister Novak, who met with Energy Secretary Rick Perry in Washington on June 26 following discussions with his OPEC counterparts on the future of the OPEC+ production cut deal, discussed Russia’s energy sector priorities and offered his thoughts on the future of energy in Russia and globally. The discussion was moderated by Daniel Yergin, Vice Chairman of USRBC member IHS Markit . USRBC together with USRBC member Debevoise and Plimpton LLP held a seminar in New York on "Investing in Russia in 2018: Challenges and Opportunities," where we explored recent developments in the current business environment in Russia. The event featured a keynote address by Denis Morozov, Executive Director for the Russian Federation, European Bank for Reconstruction and Development, who addressed opportunities for economic development and reforms in Russia in the current conditions, followed by an overview of the recent legal developments affecting the investment climate in Russia by Alan Kartashkin, Partner at Debevoise and Plimpton LLP. The event concluded with a roundtable moderated by USRBC President and CEO Dan Russell with participation of Denis Morozov, Alan Kartashkin and Satish M. Kini, Partner at Debevoise and Plimpton LLP, and Charlie Ryan, Chairman, UFG Asset Management, who discussed the impact of sanctions on investment opportunities in Russia. USRBC and the Association of Banks of Russia (ASROS) held a joint conference at the World Bank's offices in Moscow on "Latest Developments and Best Practices in FinTech Cloud Computing." The program featured the Central Bank, global IT leaders in cloud computing, financial industry experts, and representatives of Russian banks discussing the Central Bank's new three-year initiative in cloud computing, new global trends and best practices in cloud computing for the financial industry, and related developments in the Russian banking sector. 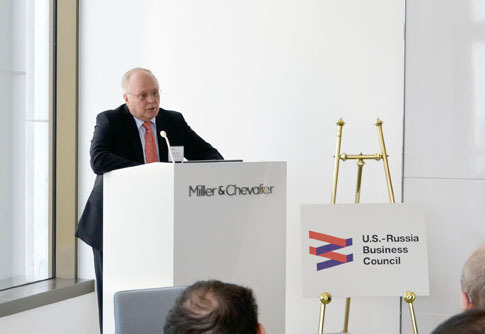 USRBC held a discussion on “Russia’s Economic and Political Outlook for 2018” with Dr. Vadim Grishin, Consultant to the International Finance Corporation’s Chief Economist, in the Washington, DC office of Miller & Chevalier Chartered. Mr. Grishin gave an overview of the Russian government’s economic policy priorities in the context of the March presidential election and anticipated accelerating economic growth. He also discussed the viability of possible economic reform paths and competing policy priorities. The Council would like to thank Miller & Chevalier for sponsoring this event. On the heels of the recent announcement on sanctions related to Russia’s defense and intelligence sectors and a series of Administration Russia-related reports to Congress under CAATSA, USRBC presented a program featuring former and current U.S. government officials to examine the U.S. sanctions regime against Russia, its genesis and distinctions from other U.S. sanctions regimes, and a review of the latest Russia sanctions developments. T he U.S.-Russia Business Council, in partnership with the American Chamber of Commerce of Russia and the Eurasian Economic Commission (EEC), held a conference in Moscow on "Eurasian Economic Integration: New Challenges and Opportunities." 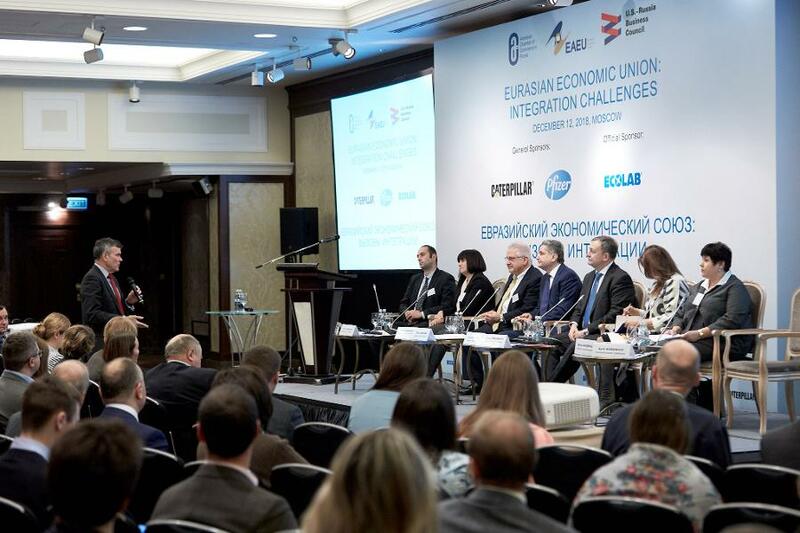 The conference featured EEC Chairman Tigran Sargsyan and EEC ministers who discussed the future of Eurasian integration and provided in-depth looks into customs policies, technical regulations (particularly pertianing to the pharmaceuticals and medical devices markets) and competition policy. The conference also addressed the best practices of mutlinational companies operating in the Eurasian market. 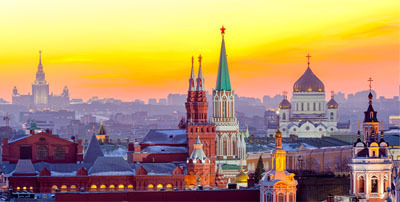 The USRBC, in cooperation with member companies KPMG and Egorov Puginsky Afanasiev & Partners, hosted a discussion in Moscow on "Localizing and Protecting Your Business in Russia: Corporate Intelligence, Due Diligence and Compliance." The event drew from government officials and experts in the field to review current investment incentives as well as guidelines to properly vet potential partners and suppliers. As companies look to increase their local presence in Russia, particularly for those interested in establishing or expanding a manufacturing base, this discussion helped with strategies to reduce risks and ensure successful investments.